Our employees are our biggest asset. Hinckley & Rugby prides itself on providing a family friendly culture across its eight branches in Leicestershire and Warwickshire and Principal Office in Hinckley. We understand the importance of promoting a healthy work life balance and are constantly reviewing and improving our current processes and rewards to remain an employer of choice. 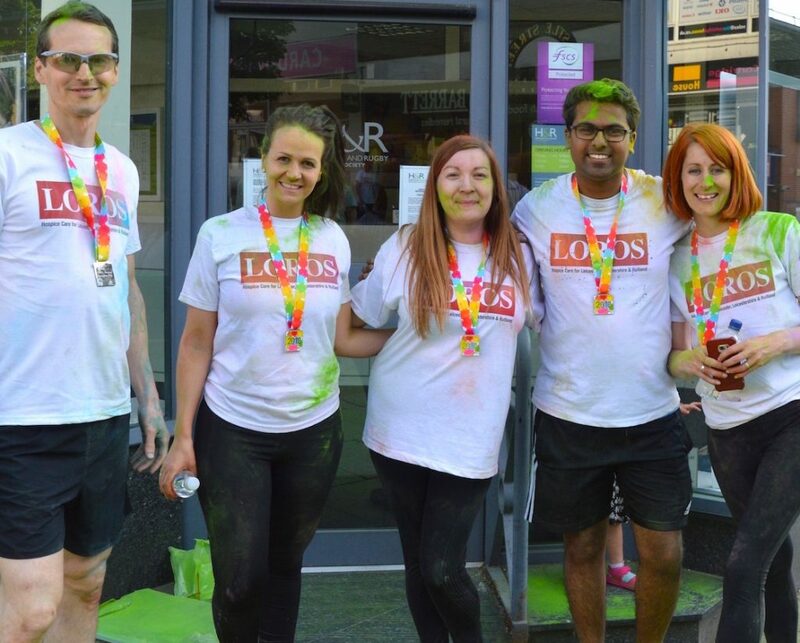 The Society sponsor the annual Loros Colourfun Run in Hinckley which sees hundreds of local people run around the town centre while being showered in powder paint to raise money for the charity. Here are our team of runners outside our branch showing off their medals. Our friendly and supportive culture is evidenced by the number of employees who have celebrated milestone service anniversaries with us. One of our employees has served more than 40 years with us and two senior managers have celebrated 30th anniversaries in recent years! Several others have clocked up more than 20 years of service. One member of our branch team continues to serve the same local community – by choice – after working for us for a quarter of a century. Our employees get involved in lots of local and national charitable and community events, with regular dress down days and a day of activities each year in aid of Children in Need. We support our employees through their personal and employment journey at Hinckley & Rugby. We do this through role specific Learning and Development, regular appraisals and one to ones, as well as day-to-day on the job support. We understand our employees and believe a good team is stronger than the sum of its individual members. We work hard to create an environment of co-operation, consultation, agreement and friendliness in all of our offices and branches. We trust our employees to do their jobs efficiently and professionally and, in return, we provide a working environment that promotes a supportive culture and opportunities for our employees to fulfil their potential, expand their knowledge and meet their career goals. It’s a relationship of trust on both sides. Effective communication, at all levels of the organisation, is the cornerstone of our success, coupled with respect for all employees. We not only talk the talk, we listen, learn and act. Employees are encouraged to play an active role in the development of the business through participation in committees and making employee suggestions, in return, we have an established recognition scheme to reward innovation and improvement.